I’m sharing something that not many people know about me. Not even Superman knows this. I keep at least one box of brownie mix, stashed way back in the back of my pantry. It is there for one reason, and one reason alone. So I can mix it up and eat it……raw. I put it in the fridge and it turns to this semi-solid fudgy goo that is just perfect for when a chocolate craving hits and there just. is. no. more. chocolate. in. the. house. Which is rare, but it has been known to happen, hence the stashed .99 brownie mix. It is also the reason that I picked today’s TWD, Rick Katz’s Browies for Julia. You see this bakes up chewy on the outside. And just a wee bit gooey on the inside. Once it cools completely it isn’t runny anymore, but I am not know for my patience, so I cut a piece 20 minutes out of the oven, and Internet…it was perfection. The recipe was very easy, and I only used 2 bowls. No mixer was involved, but that is only because my strapping son offered to whip the eggs till they were doubled in volume. Dorie writes “In 1995, when I was working with Julia Child filming the PBS series Baking with Julia and writing the companion book, Boston-based pastry chef Rick Katz was running the prep kitchen in Julia’s basement. Working between the washing machine and the dryer, Rick was in charge of getting the recipes of each of the twenty-six visiting chefs ready for their close-ups. An ordinary human would have had his hands full, but superman Rick always found time to make us extra little goodies, among them these very dark, very fudgy brownies. The way he prepares the batter is different from any other brownie recipe I know. Half of the eggs and sugar are mixed in with the chocolate, while the other half are beaten until they double in volume and are as light as a sponge. 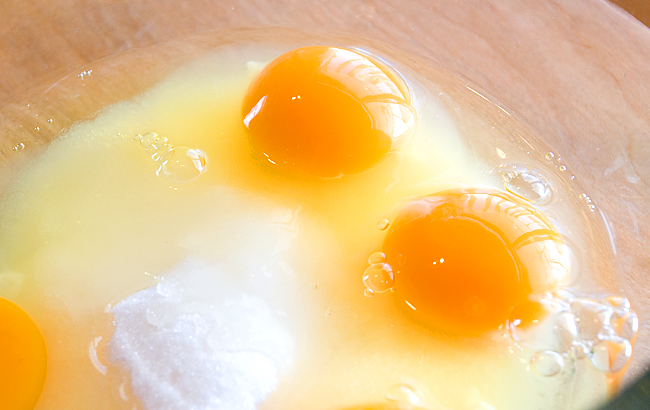 Whipping the eggs creates the surprisingly creamy, soft and definitely fudgy texture. Center a rack in the oven and preheat the oven to 350º F. Put a 9 inch square baking pan (I like to use Pyrex for this) on a baking sheet. Whisk flour and salt together. Set a heat proof bowl over a saucepan of gently simmering water, put the butter and chocolate in. 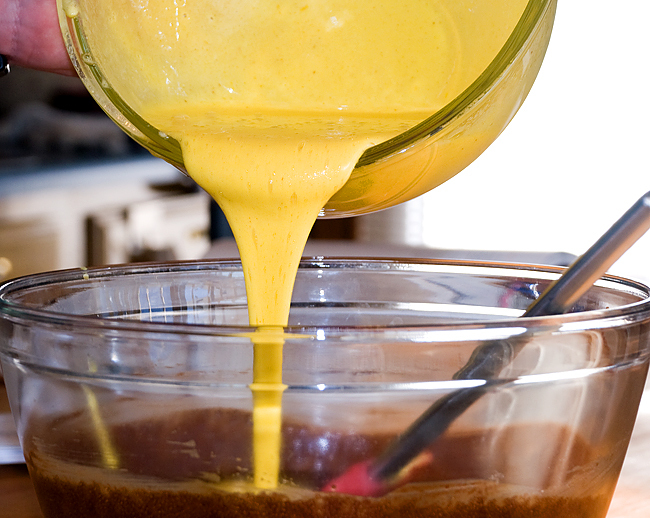 Stir frequently until the ingredients are just melted-you don’t want them to get so hot that the butter separates. I melted these in the microwave in my usual fashion. 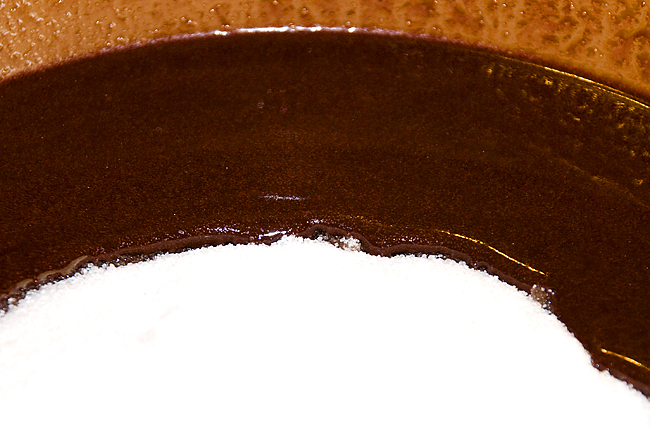 Add 1 c. sugar and whisk gently just to incorporate it, then remove the bowl from the pan of water. Stir in the vanilla and transfer to a large bowl. I sure hope that y’all enjoyed these as much as I did, and thanks for baking along with me today. Thanks for hosting the pick. Loved the flavor even if mine was too gooey on the inside! OMW, it was supposed to look like chocolate soup?? I failed. I kept baking it until it would at least hold together. No matter, guys loved, loved, loved them and I have made them three times that way so far. I have no idea what that crusty top is all about on mine, but they loved that part the best. Hence the request for me to keep making them. Thanks for the pick. Cute doggie, btw. Raw chocolate brownies is your weakness? I am in awe that this would be something you would crave. LOL…what I learn over here! Kayte, I have tried and tried to comment on your blog, but it just won’t let me. I don’t think you failed at all. Your brownies are lovely and if your guys are eating them as fast as you say, then you are doing it all right. Your comment came through, TWICE! With my blog, you just comment and hit submit and it goes through, waits for my approval (I have children who read so I don’t want them to accidentally stumble upon some spam comment, etc. ), and then when I approve, it posts. I took off all the scrambled word business, etc. as it seemed like such a hassle for comments. Yours come through each week just fine. Thanks! Great pick. Can I join the local chapter of Brownie Batter Anonymous too? I am guilty as charged. I would join the BBA as well if I weren’t allergic to chocolate now. One of the best memories I have of us spending time together is making a batch of brownies at your house and eating them while they were still fabulously gooey. Dirty little secrets? No, like I said, you’re just honest with an honest to goodness delicious blog. Love your brownies! Love to eat brownie batter and I found the batter for these fabulous, it sat thickening up like fudge before I washed the bowl, so of course, I scraped it and ate it! That last photo, I’m totally sure, is straight from heaven! Your secret is safe with us! This was a wonderful recipe choice and we really enjoyed these brownies. I had to bake them a second time because mine were just too gooey, but I really loved the results. So darned tasty! These were good brownies. I thought the recipe was too fussy. Ah well. Thank you for hosting TWD this week. I enjoyed your choice of recipes even if I did the directions on page 90!! Your brownies look so tasty! Hey Chic. Superman knows now…..Or does he read your blog??????? He sometimes reads my blog….but rarely. Thanks for the pick this week! DELICIOUS. And finally a Dorie chocolate recipe without anything weird like dried fruit! Hooray! Great pick, Tanya! We loved the deep fudgy center and chewy edges. Tanya, thanks for this fantastic pick!! Loved, loved, loved these brownies!! Your photos are amazing! Can’t wait to make these again!! I think I just gained 10 pounds reading your post. You stash brownie mix. I stash a bag of chocolate chips…for emergencies of course. Too funny! 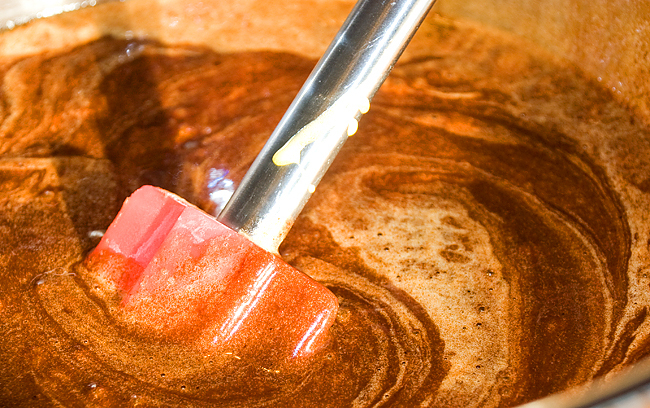 (but a great idea with the brownie mix). I’ve been guilty of the same kind of thing. And I have my chocolate stashes that nobody else knows about. I will have to try these brownies. They sound deliciously perfect. I have my favourite brownie recipe and I always slightly underbake them so they are still just a little gooey in the middle. And I always use rum flavouring instead of vanilla – it really brings out the chocolate. mine were totally just as gooey. and yes…I enjoyed them! What yumminess! I baked a “best ever brownie” last night. It is the best ever that I’ve baked yet, but this one looks amazing. It’s all your wonderful photographs! Thanks so much for your pick this week Tanya! I’ve never enjoyed fudgy brownies but this recipe made me a convert. These are my new favorite brownies 🙂 Yours look awesome!! I loved the brownies and I love your blog. I knew that I could count on you for a great chocolate pick. I LOVED these brownies! Perfect pick! Even though I baked them longer than suggested, to me they came out great. Happy TWD week! Great pick!!! These were fudge-city!!!! YUM!! Your photos are gorgeous, as always!!! Thank You for the great recipe pick this week. These brownies were incredibly fudgy and they were a big hit in our neighborhood. Wonderful choice! I baked mine in muffin pans so I could have more ‘edges’. Delish! A box of MIX? I’m astounded. But intrigued, in a weird kind of way! Great choice – these were really great! As far as the brownie batter eating goes – I am so there with you. Love it! Your brownies look so molten and lovely! I think I would like them this way better than when they firm up – definitely worth another try that way. Thanks for the great pick! We loved these! Great pick. We loved them. Your pictures are wonderful. Thanks for picking these brownies. We love them. All that chocolate….gooey chocolate. Nothing better. i have had some good brownies in my life, but i have to say, these may be the best i have seen. Gooey chocolate – it’s the best! Thanks for this great pick! Fabulous choice this week!!! Thanks for picking these brownies. I’m glad I doubled the recipe. Your pictures are beautiful! 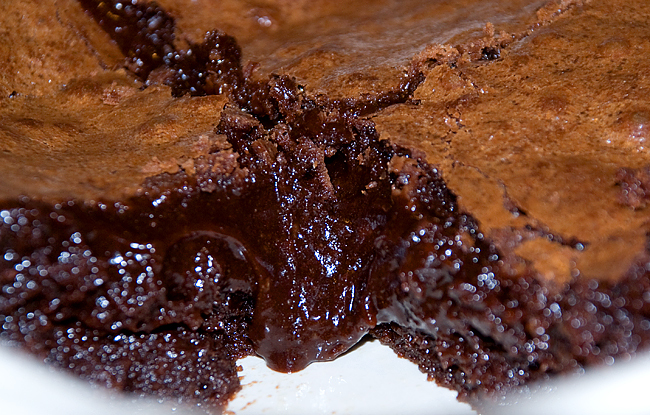 These look fantastic–gooey, just the way I like my brownies. If I bother to bake them at all! Can I join your brownie batter-eating club? Sorry I couldn’t bake along this week, but I am out of town and only managed to make 2 of this month’s recipes. The technique sounds interesting, though, and these will be the next brownies I make! Thanks for hosting this week. These brownies were awesome! I am a batter fiend as well! And this batter was OH so good. Then again, the brownies had the consistency of batter, too, so it was a win, win for me! Loved this pick! Thanks so much! What a bombshell!! Raw brownie dough? I mean I lick it off my fingers when I make it but it never occurred to me to make a brownie FUDGE! You may have unknowingly changed the way people view fudge!! They look oh-so-gooey… which I’m sure you loved!! So glad I could help you view fudge in a whole new light. You are just toooooooo much !!! No wonder I love you. THANK YOU for a great choice!! It was a great recipe to recharge my TWD blog which had gone quiet for much too long!! Looks gooey and great! Good choice. Thanks so much for this choice. These brownies are fantastic! As far as I am concerned these brownies are a total Homerun!!! I love the Gooo! Its the best. Thanks so much for choosing such a fun recipe and so delicious. I think I may make them again. Love your photos. Yes, when my 22 year old was in grade school and played little league and all star baseball, Martha White brownies were my absolute fav! I added chocolate chips for even more goo and a little vanilla. Those mixes saved me time and again for nightly baseball summer nights. Night after night! So your secret…… well, its a good one. I don’t have a chef son (or daughter or any nearby chef relative, for that matter). You’re so lucky! I didn’t know that it was your turn this time around until I saw someone else’s TWD pick. When I first saw the brownies, I thought, “Oooo, Chocolatechic is going to love this week’s pick! !” LOL!! Little did I know that you were the one who picked it. Hilarious! I guess I was right, though. Great pick. I’m bookmarking this recipe for later use. Outstanding pick this week Tanya! I haven’t been able to taste these brownies yet, but I have a couple of them tucked away in the freezer for those midnite cravings. 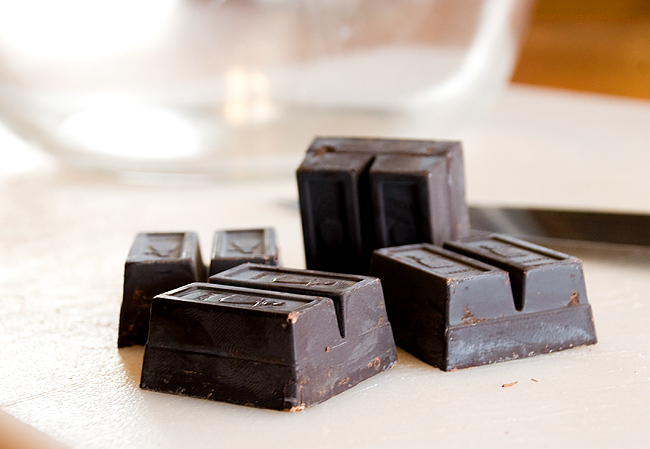 Gotta love the confessions of a choco-holic…i’m there with ya! Thanks Tanya…these brownies were so darn good!!! GREAT PICK!!! Even though I don’t seem to be able to read the recipe correctly and my brownies turned out less than stellar I guess I should chalk it up to baker error vs recipe error. But I’ve read so many great reviews from all the other TWD bakers that I might need to attempt this one again. Thanks for the great pick this week! Next time I make brownies I may have to attempt it along with my usual recipe so that I can compare them. I’ve never run out of chocolate at my house….that is an inpardinable sin around here and I would think at your house as well! I am shocked beyond believe that you would run out. Don’t you keep a supply of chocolate chips around for just in case?? As others said, thanks for a great pick this week! I usually like cakey brownies, but if I feel like making fudgy ones, I will use this recipe for sure. YUM. My little chefs (2 y.o. boy and 10 mo. girl) helped me out by taking their naps while I baked away! Can’t wait to try these! I’m going to make them tomorrow! I didn’t get a chance to make these yet (big snowfall and issues getting proper ingredients) but I can’t wait to try them out. My best friend and I used to make brownies from a box, cook for about 15 minutes, and then devour the whole pan with a couple of spoons. I love your box of brownies story. Gosh, that brownie looks super decadent! A GREAT brownie recipe! Thanks for choosing it – just perfect for Valentine’s Day coming up (how’d you manage THAT luck)! Looks wonderful – and love your photos! Excellent choice, these are my favorite Dorie brownies! Yours look fabulously gooey, yum. I admit I always have a box of brownie mix in my cupboard, I think they’re a great comfort food. Really appreciate your passion and great photos, it looks like you enjoy chocolate, have a look at my profiterole tower, you might like it. Ciao ! First thing thank you for hosting this wonderful recipe ! Then complimenti for your brownies ! LOL – raw brownie mix sounds good to me! Thanks for choosing these, they certainly were a hit! I made one in a ramekin and topped it with ice cream and chocolate sauce…. MMMMMMM! a good pick, for sure! we loved these! These were sooooo good. Fabulous pick but so surprising you picked something chocolate! Loved them. These were some of the best brownies I’ve ever had. Thank you! Thanks for this great choice! We loved these brownies, they are divine. Yours look delicious! My mom is still talking about these. I have no doubt I will be conned into making them again for her. I had to pawn off the rest of my pan before I ate it all myself. Great pick. RAw brownie mix works for me. Love yours. NIce and gooey. YAY!!! and YUM!!! I didn’t get to make these yet but I sure will. I love brownie mix raw, too. Sick I guess but delicious! 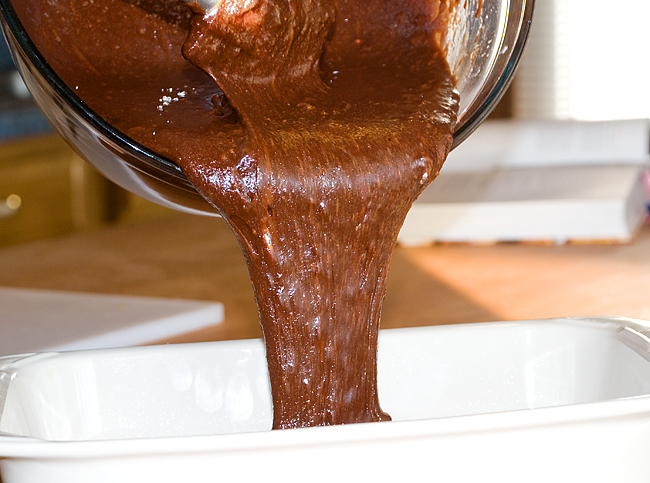 I can’t say that I have tried raw brownie batter but this recipe is a good one, i know that much! What deliciously gooey looking brownies you made! I thought this was a really good brownie recipe except for the extra dishes required. I’m lazy when it comes to brownies. Thanks for a fun pick. Thanks for choosing this recipe – it was amazing! I love raw cookie dough. Not so sure about the brownie mix though. When I was a little girl my mom let me make a batch of refrigerator cookies just to eat the dough. Even though I got really sick of it I still like to eat that stuff. Great pick! I love brownies and these were quite good. I did bake with you this week! I just have been swamped and haven’t had a chance to post. Perfection! We loved these! Thanks for the super chocolaty pick! Thank you for the great pick this week! These were so, so chocolatey and I’ve found myself thinking about them many times and wishing there were more! These would be perfect for a major chocolate craving, although I really like your boxed brownie batter idea. Perfect for emergencies! You hit it out of the park with this pick! 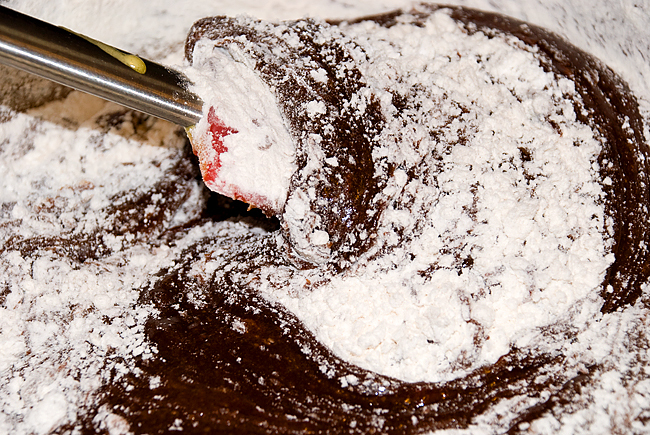 Especially for those of us who (secretly or not-so-secretly) like our brownies on the gooey side. I loooooove brownie batter. And chocolate chip cookie dough, too – without the chips. How weird is that? 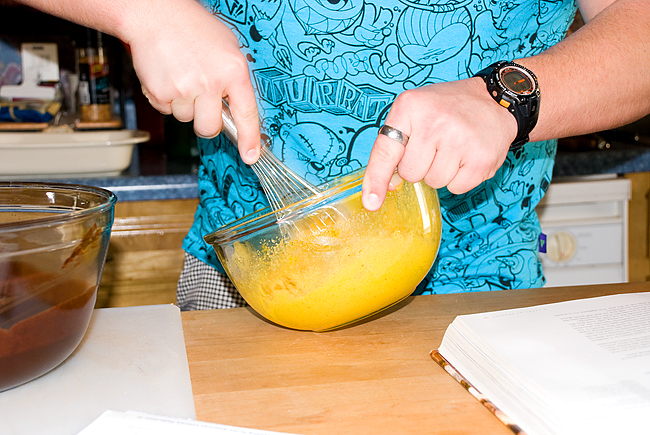 question: the sugar and eggs….is it just whisk till well mixed? or until pale and poofy and foamy? I love this recipe, I am using it as the base for a bunch of different brownies I am making this month. I love that they are rich and fudgey but maintain a bit of cakiness. I just found your blog and will be making these brownies asap! Hello, I just came across your blog and thank you for this recipe! I just tried it, however, I cut down the amount of sugar in the recipe for whipping eggs to 3/4 cup. Could it have a significant effect on the egg whipping? I used an electric beater and then later by hand but I couldn’t manage to get it as thick as yours in the photo – or maybe both the mixer and I aren’t as strong as your son! It probably was the lack of sugar. Did you enjoy them? They are such great brownies! I come from Australia so I don’t know what “one stick of butter” is equal to. Could you please tell me what it is in grams or ounces? One stick of butter is 8 tablespoons. I’m just about to attempt baking these brownies, the last ones I made turned out too cakey – there were only 2 eggs in that recipe so I think that 4 eggs will make a big difference this time. I’ll comment on how they turn out when Im done putting on 15pounds eating them! Wish me luck! OK wow. They are AMAZING- perfectly Gooey! The only thing I changed in the recipe was that I added a level tsp of baking powder and I cooked them in 9×9″ pan in parchment for 40 mins. Absolutely devilish, thank you so much for this recipe! These are the best brownies I have ever made. I mix them like regular brownies and add 1/4 cup of cocoa. Bake them in a 9 x 13 pan and pour a fudge frosting over top once they come out of the oven. The only brownie recipe I use. Thanks!